Jatropha podagrica (Buddha Belly Plant or Gout Stick), a popular tropical herbaceous perennial belonging to the Euphorbiaceae family and native to Central America, is ever so generous! Not only does it produces flowers and seeds so readily, it self-sow as easily too without any fuss from seeds that are thrust far and wide when its highly dehiscent seed pods ripen and explode. 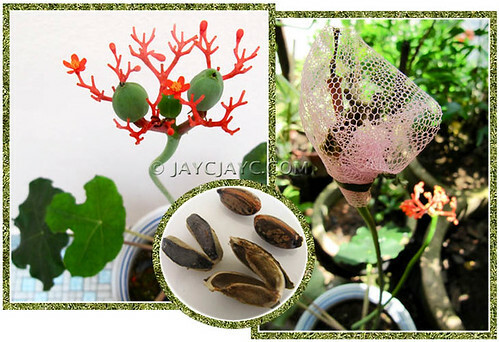 Propagating Jatropha by seeds that germinate easily is rather simple actually, but gathering the seeds is a tricky business altogether. Thus, if you’re really keen to get as many seedlings from your garden plant, be sure to bag the seed pods as they start to turn brown with a plastic bag or netted cloth/stocking to capture the seeds. Otherwise, when the greenish seed pods begin to mature and ripen to blackish brown when you least expect, they will burst open to scatter the seeds several meters away and would be rather difficult to trace then. Once the smooth and glossy brown seeds are collected, you can sow them about 3 cm apart and 1 cm deep, directly into your garden bed or in a pot filled with well-drained potting medium that is mixed with some coarse sand. Best that they be sited at a sunny spot. 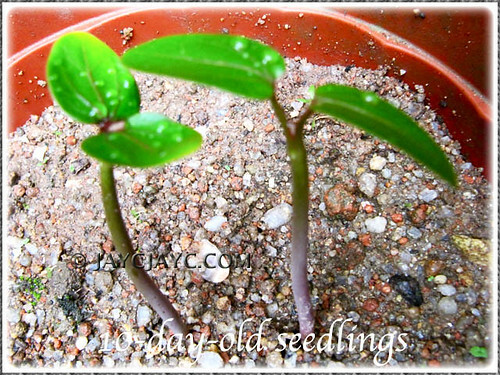 With sufficient heat and the soil kept evenly moist, the seeds should germinate easily with 2 weeks. 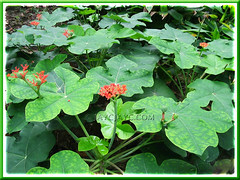 Learn more about this lovely medicinal plant, Jatropha podagrica and its culture here. Enjoy gathering and sowing seeds! I got this plant passed to be by my office friends. Somehow the plantlet seemed to be a very slow grower – like the desert rose. Does your plant grows fast? We had 2 seedlings. I’ve observed that the one in the shade is slow-growing whereas the other that’s receiving sufficient sunlight is flourishing at a healthy pace. Hi,—–what time of year should packet seeds be planted? Sorry, we’re just home gardeners and not a retail nursery. My plant is about a year old. It had grown very slowly until I repotted it in a bigger pot and sat it outside for sunning. Since then it is constantly putting on new foliage and flowers. It has recently developed a seed pod. About how long before I should expect the explosion of seeds? I would advise that you bag the seed pod as it starts to turn brown with a netted cloth/stocking to capture the seeds. I have had success with the seeds by just soaking them in water for about 5 days. By then, the seeds have already sprouted. 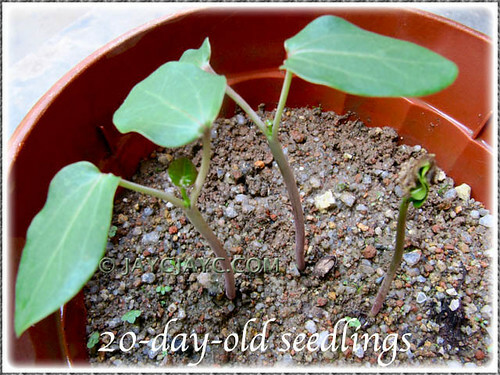 I just plant them in dirt with the sprouted seedling above ground.